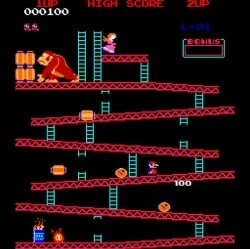 Every time someone breaks the Donkey Kong record, you think this one is for keeps. It seems amazing that anyone can still improve this game’s high score. According to Twin Galaxies, the official site for arcade player rankings, the World Record on the classic arcade game Donkey Kong has changed hands for the third time this year, as former champion Steve Wiebe climbs back into the top spot with a score of 1,064,500 points. “Wiebe last held the Donkey Kong record in spring of 2007, only to be bested by his movie rival Billy Mitchell months later. Mitchell’s score fell to New York’s Hank Chien in March of this year, but the Florida hot sauce distributor regained the title on July 31 with a score of 1,062,800 points”, says the article on Twin Galaxies. 1,064,500 points seems like an amazing score. I wonder how long it’s going to last.